The manifestation of such great saints is purely for the salvation of souls. Unlike ordinary beings, they manifest and depart according to their will, but not through the ideology of karma. Some may be disillusioned by the departure of Jeevanpran Swamibapa, but His true disciples will see this as just another phase in His divine leela. A recollection of Jeevanpran Swamibapa’s final day, written by one of Swamibapa’s beloved sants who accompanied Him on that day, is given below. This article was first published in the organisation’s monthly publication, Shree Ghanshyam Vijay. On Samvat 2035 Bhadarva Sud 7 (Thursday 20th August 1979) Swamibapa awoke as usual at 2.00 am and performed His daily rituals of meditation, chanting and scripture recitals. Swamibapa bathed and performed His pooja. Jeevanpran Swamibapa, Acharya Swamishree and the sants then went to the Mandir for darshan and aarti, before departing to visit the Lake District. At 10 O’clock, they arrived at Lake Windermere. Hundreds of disciples had also gathered from various different places from around the country. The visit began with a tour of the huge lake on a cruiser boat. Jeevanpran Swamibapa and our beloved Acharya Swamishree were sitting on the same seat, and Swamibapa was chanting with a mara. All of a sudden, Jeevanpran Swamibapa stood up, grabbed Acharya Swamishree and they lovingly embraced. We cannot even imagine the great love that this Guru and Shishya must have had for one another. This embrace was captured by the photograph we all know as the “bhet naa murti”. And because of this photograph, we are still able to have the divine darshan of this loving leela. Throughout the boat ride and the rest of the day, there was a constant dialogue between Jeevanpran Swamibapa and Acharya Swamishree. No one knows what they were saying to each other. No one could understand them. It was as if they were speaking in a divine language. After the boat ride, everyone congregated on a hill by the side of Lake Windermere and a sabha was held. Jeevanpran Swamibapa showered His divine blessings. It was a beautiful warm and sunny day. Jeevanpran Swamibapa pointed to the sky and said, “Look at the clouds in the sky. It is covered with what looks like lines that have been drawn over it. These are not clouds. These are the marks of all the deities and incarnations seated on their divine aircraft, who have come for the darshan of this sabha.” The deities must have known that this was the last day they would have the darshan of Jeevanpran Swamibapa on this earth, and so they had come in their abundance. Photographs of this sabha clearly show these streaks in the sky, the marks that these deities had left behind. Jeevanpran Swamibapa talked about how He had come to the UK after doing a chovat, a debate, for 27 days. Let us consider the true significance of this one statement. It is evident from these words that Jeevanpran Swamibapa had planned this day to be His last in human form upon the earth. This was not the first time that Jeevanpran Swamibapa had uttered these words during this trip to the UK. He had previously mentioned it several times in London as well. In Samvat 1948, Sadguru Shree Nirgun Bapa and Jeevanpran Shree Abji Bapashree were giving darshan. 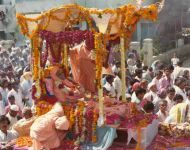 Shree Nirgun Bapa was in Ahmedabad and Jeevanpran Bapashree was in Kutch. They both took an illness upon themselves on the same day. Both became unconscious, such was the severity of their illness. This is what mortals such as us saw. After 27 days, they both spontaneously became well again and Jeevanpran Bapashree explained what had happened. For these 27 days, a chovat was held in Akshardham between Lord Swaminarayan, Jeevanpran Bapashree and Shree Nirgun Bapa. Jeevanpran Bapashree wanted to withdraw His human darshan, but Shree Nirgun Bapa refused to allow this. At the end of the 27 day long debate, it was decided that Shree Nirgun Bapa would withdraw His darshan, but Jeevanpran Bapashree’s darshan would continue. On many occasions during this trip to the UK, Jeevanpran Swamibapa uttered the same words: that He had also gone through a 27 day long chovat in Bombay before coming to the UK. The British High Commission in Bombay was refusing to grant visas to Jeevanpran Swamibapa to enter the UK. As a consequence, He had to remain in Bombay until they were given. At the end of exactly 27 days, visas were granted to Jeevanpran Swamibapa, Acharya Swamishree and one other sant. Again, that is what the mortals saw. But what really happened during these 27 days, only our beloved Acharya Swamishree knows. Maybe one day He will tell us. What the mortals saw was Jeevanpran Bapashree and Shree Nirgun Bapa falling ill. However, what really took place was the debate in Akshardham about who would depart from this earth. Similarly, mortals saw Jeevanpran Swamibapa and Acharya Swamishree delayed in Bombay for 27 days, but in reality, we still do not know what occurred. Jeevanpran Swamibapa mentioned that Swamishree knew everything. So it is absolutely evident that Jeevanpran Swamibapa and Acharya Swamishree knew beforehand that today was going to be the day that Jeevanpran Swamibapa would perform His antardhan leela. What more proof do we need that there is a direct link between Jeevanpran Swamibapa and Acharya Swamishree; that they are in fact the same divine entity? Jeevanpran Swamibapa was pointing out the parallels, and indicating that He would soon be performing His antardhan leela. However, at the time, no one could understand these divine words. 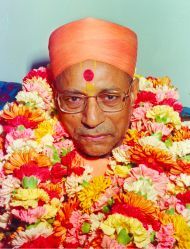 It is only now, when we recall these words, that we can understand them and see that Jeevanpran Swamibapa was telling us what He was about to do, as well as indicating the greatness of His beloved Shishya, Acharya Swamishree. After taking thaar on the hill, Jeevanpran Swamibapa travelled back to Bolton. That evening, a sabha was held at the home where Jeevanpran Swamibapa was residing. Acharya Swamishree was sitting right beside Jeevanpran Swamibapa. At 10.20 pm, Jeevanpran Swamibapa ended His divine jeevan leela. "Have too jamaade to mane jamvoo chhe" These were the last words that Swamibapa spoke before His antardhan. They were said to Acharya Swamishree. Whenever Swamishree recalls these words, He still becomes emotional. At that time, Acharya Swamishree offered a plate of melon to Swamibapa. But Swamibapa said, "Have too jamaade to mane jamvoo chhe." (From now, I only want to eat if you feed Me.) This was the last food that Swamibapa ate, and He eat this, according to His wish, at the hands of Swamishree. But what was Swamibapa also saying. Jeevanpran Swamibapa was also saying to Swamishree, "From now on, I will eat now through You (Swamishree)." Jeevanpran Swamibapa’s murti was brought back to London and then taken onwards to India. 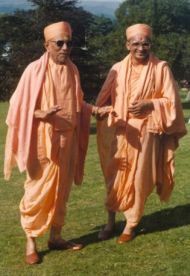 When Jeevanpran Swamibapa was brought to the London Mandir, Acharya Swamishree allowed the coffin to be opened to allow everyone to have the divine darshan of Jeevanpran Swamibapa’s murti. As soon as Swamishree opened the coffin, Jeevanpran Swamibapa opened His eyes. Many sants and disciples saw this miraculous occurrence. This proves that Jeevanpran Swamibapa had not gone, but is a divine entity. It is also proof of the love that Acharya Swamishree and Jeevanpran Swamibapa had for each other. As Acharya Swamishree opened the coffin, Jeevanpran Swamibapa simply had to open His eyes and look at the adoring face of His beloved son, Acharya Swamishree. Before leaving for India, Acharya Swamishree said to everyone, “The time has now come to prove whether you are the true disciples of Jeevanpran Swamibapa. Whilst Jeevanpran Swamibapa was giving darshan, no one could openly oppose Him or His actions. But from now, it will be visible which of you have faith in Jeevanpran Swamibapa’s words. Now is the time to put into practice, the divine knowledge that Jeevanpran Swamibapa had given to us all. Now is the time when you will all be tested.” Those who passed this test, who adhered to Jeevanpran Swamibapa’s commands and were truly Jeevanpran Swamibapa’s children, are sitting here today in the divine assembly of Lord Swaminarayanbapa Swamibapa, at the shelter of Shree Swaminarayan Gadi. Those who were not Jeevanpran Swamibapa’s children, who did not have faith in His words and actions, have failed the test. These people have not been able to remain a part of this divine assembly. 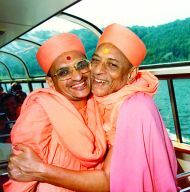 They have removed themselves from the shelter of Lord Swaminarayanbapa Swamibapa and have created an irreparable rift between themselves and Jeevanpran Swamibapa. This gap will never be removed. Let us all pray to Lord Swaminarayanbapa Swamibapa and Acharya Swamishree that we never fail the tests that we encounter throughout our lifetimes, so that we will never become removed from this divine sabha. Let us pray that we maintain total faith in the words and actions of our beloved Acharya Swamishree and abide by His every wish. Only then will we be able to consider ourselves the true children of Lord Swaminarayanbapa Swamibapa.